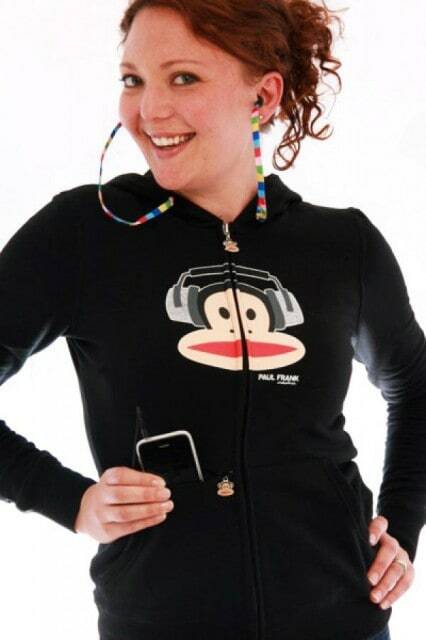 This hoodie is very cool, and has that typical Paul Frank cheekiness about it. You know how you want to listen to music when you’re wandering around, but you have to mess around with the cable from the headphones so that it isn’t dangling around, well this hoodies solves those issues by having a headphone jack in the pocket and earbuds at the end of the drawstrings. My first thought when I saw this was “how do you wash it?” It says on the product page that the hoodie is ‘machine washable’ so clearly that’s been taken into consideration. I doubt that you’ll be getting the same sound quality out of these earbuds as with a pair of badass Skullcandy ones like mine, but come on, the headphones are in the drawstrings, how cool is that!? I saw this hoodie at macy’s on clearance for 9.99! i had to get it. I just got this today it is so decent i got mines from macy’s they decent. So , I have looked everywhere for one online at Macys . I cant find it ! Pease ! , Can I have a link ??! Hi! i was wonderig if anyone had seen this at a macys in Richmond, VA like LATELY, as in the past week or so. I really want one but i didn’t want to make a trip to Macys only to find they were all gone. thanks! So do you just throw it in the washing machine? How do you wash these hoodies with the built in headphones? where can i get one of these hoodies ?_?